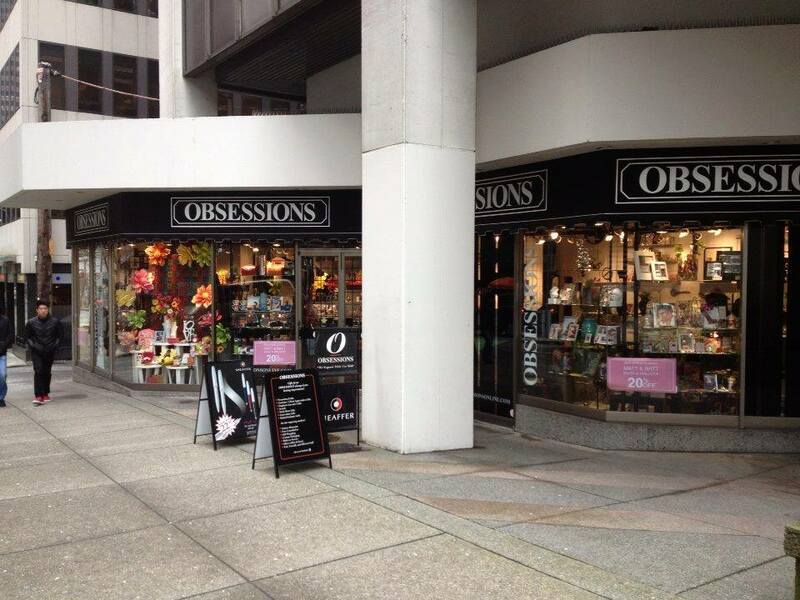 OBSESSIONS was originally founded in 1988 in the trendy area of Earls Court, London England. A small boutique store offering a unique selection of personal and home accessories. James Hough and his partner Paul Dart originally conceived the original concept afterÂ combining James’ retail experience and Pauls’ many years working in theatres around theÂ U.K. as a set designer. The original store interior and all subsequent outlets consist of aÂ basic theatre stage set-up; white walls, black floor and a black utilitarian scaffoldingÂ framework for lighting and shelving. On and around these basics the in-houseÂ merchandiser/designer constructs new backdrops for the presentation of merchandise. Â Obsessions quickly gained a reputation for always producing exciting, dramatic andÂ mostly always, over-the-top window displays especially around Christmas and Valentines. Â Paul soon found himself being asked to produce large-scale projects for London’s OxfordÂ Street and St. Christopher’s Place Christmas displays. Paul was also asked to put togetherÂ stage design for a fleet of American Cruise ships. Needless to say with Paul’s increasingÂ workload it was necessary for him to depart Obsessions to form his own design company,Â which now ten years on, is one of Britain ‘s largest companies for special events andÂ display productions. Wales, which Guy conceived and developed. The aggressive expansion of Obsessions came when Mark Kenna joined the company laterÂ in 1992. After the successful opening of the second store, four more stores were added overÂ the next two years in and around London’s financial district. In 1995 Guy bought theÂ company from James and together, Mark and Guy developed a winning relationshipÂ sharring the same vision of where Obsessions was to go. With Guy’s financial backing andÂ Mark’s many years in retail management and design, it was obvious that the company wasÂ heading in the right direction. OBSESSIONS has changed dramatically over the years to accommodate its expansion through changing economic climates and has been able to comfortably adapt to new trends in the marketplace with ease. Obsessions went international in June 1998 when Mark (then Retail Marketing Manager Director UK) immigrated to Canada with his business partner Alex Barker to set up OBSESSIONS Canada in Vancouver, BC. The company was an instant success growing from one small Kiosk in Pacific Centre Mall, downtown Vancouver to 4 street locations within 5 years plus a vibrant ‘Corporate Gift Division’ plus an online website. Unfortunately the company was hit hard by the world wide recession some years ago and an unforeseen government construction project outside one of the companies stores which inhibited consumer access both led to the company being downsized then subsequently being purchased by a new business partner with the co-operation Mark Kenna who still manages and purchases the stores gift items.Â Â Despite the company’s ups and downs, this store is considered one of Vancouver’s premier gift stores often winning annual awards for ‘Best Gift Shop’. Â The company has one prime location in the centre of town on the corner of Dunsmuir and Howe Street, and is comfortable with no intention of expanding except for a new website with the ability to buy online. The ‘Corporate Sales Division’ continues to also thrive and increase annually. Providing first class customer service to its many loyal shoppers and greeting many new ones each day and each season as the tourists come and go…after 28 years in business this robust, hardy and unique company intends to be around for many more years to come. Obsessions Retail Inc. Copyright © 2018 all rights reserved.